With Amazon, Barnes & Noble, Kobo, and Sony only launching slightly updated versions of their existing ereaders in the past year, the drive for innovative new ebook readers here in the US has largely fizzled. Luckily the same cannot be said for the rest of the world. 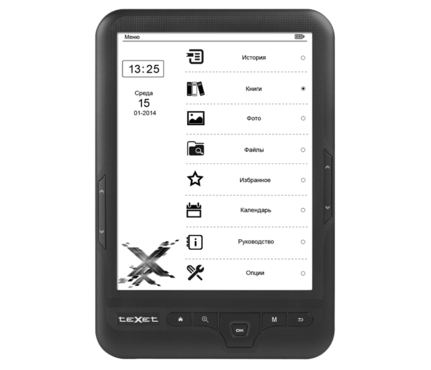 TeXet, a Russian gadget maker, has just announced their second 8" ereader. 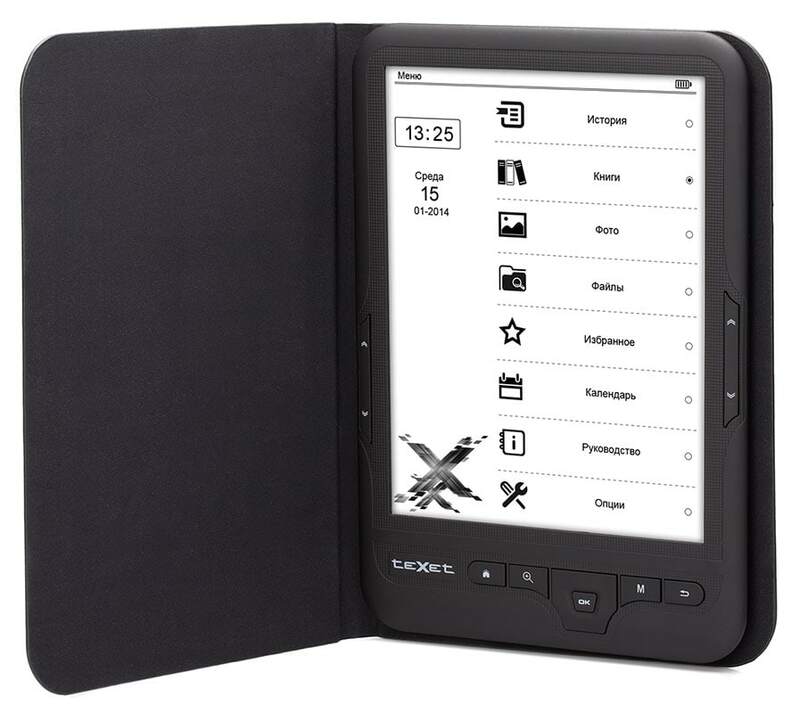 The TB-418FL is one of the growing number of 8 inch ereaders that don't have an E-ink screen. No details are available on the CPU or OS, but I can say that it has 4GB internal storage, a microSD card slot, page turn buttons on both sides of the screen, and a frontlight. Curiously enough, this ereader lacks Wifi or a touchscreen, which would have made it a one of a kind device had it been launched in the US. This ereader's 8" screen has a resolution of 1024 x 768, just like the screen on the Cybook Ocean from Bookeen. Depending on how you count it's the 4th or 5th ebook reader to use the screen, which was produced by E-ink rival Ganzhou OED Technologies. That company, which is jokingly referred to as producing knockoff screens, is having growing success in offering screens that cost less than comparable screens from E-ink, including 4.3", 6", and the 8" mentioned above. In terms of features, the teXet TB-418FL supports a wide variety of ebook formats, including PDF, Epub, Mobi, FB2, PDB, and DJVU. A number of common office doc formats can also be read on this device (Doc, txt, rtf, html, chm). Reading features include PDF reflow but not much more than that. Readers can change the font size, add bookmarks, and invert the screen (white text on a black background). The TB-418FL is available today in Russia. The retail price is 7499 rubles, or about $212 USD. That is expensive, yes, but gadgets generally cost more in Russia than in the US. Is Amazon’s dominance of the American market suppressing tech innovation? Increasingly we are seeing a lack of device choice in America. It’s not entirely Amazon’s fault that the prices for ereaders dropped so steeply in 2010, but Amazon is keeping prices low. in order to discourage competition.